SLS, SLES and LAS market is highly fragmented. However, just a couple of major players, for example, Henkel, have incorporated their operations over the value chain. Subsequently, new participants face head-on competition and are struggling to keep their positions intact in the SLS, SLES and LAS market. Developments brought about by few organizations are disrupting the market majorly. They are seen investing in innovation through research and development. Different makers have begun concentrating on the advancement of bio-based surfactants, because of growing awareness among shoppers about nature-friendly items. Some of the main players in the worldwide SLS, SLES, and LAS market are Stepan Company, Huntsman International LLC, Croda International Plc., Clariant, Solvay, Lion, and TAYCA Corporation. As indicated in a recent report by Transparency market Research (TMR), the global SLS, SLES, and LAS market was worth US$8.23 bn in year 2016. This market figure is anticipated to reach around worth US$11.61 bn before the finish of year 2025. From the forecast period from 2017 to 2025, the worldwide market is evaluated to surge at a moderate CAGR of 4.0%. Based on applications, the detergents and cleaners category is required to lead the worldwide market because of general growth in the disposable incomes among the masses. On the basis of geographical regions, Asia Pacific is expected to lead the worldwide market as buyers are foreseen to spend on personal care items in coming times. The surge in the demand for personal care items has impacted the global SLS, SLES, and LAS market. The market is likewise anticipated to thrive in the coming years due to the rise of textile and leather. Besides, increase in the production of detergents and cleaners and oilfield chemicals is anticipated to help market development in coming years. As indicated by Cosmetic Ingredient Review, SLS and SLES are to a great degree safe crude materials for manufacturing beautifying agents. 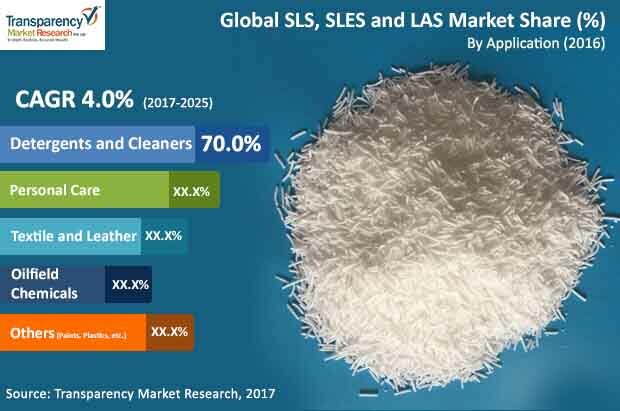 The detergents are the biggest consumers of SLS, SLES, and LAS, which in turn is because of the rise in wages of people worldwide. Increase in the production of surfactants in developing economies because of increasing awareness about cleanliness is also bringing about market development. Moreover, there has been a rise in inclination towards LAS when contrasted with different surfactants. Moreover, LAS is sensibly evaluated when contrasted with different surfactants, which is anticipated to drive up its demand sooner rather than later. Accessibility of different individual care items and detergents and cleaners is likewise anticipated to help deal within the forecast period from 2017 to 2025. On the other hand, the worldwide SLS, SLES, and LAS market is probably going to be hampered by the dangerous effect these substances have on the nature. The rising awareness about this effect among the end clients is anticipated to affect the global market soon. In any case, manufacturers are additionally concentrating on developing items that are comparatively less harmful. Expanding interest in innovative work of product that don't have adverse effect on kids is additionally anticipated to support market demand in coming years. The surge in the demand for personal care items has impacted the global SLS, SLES, and LAS market. Increase in the production of surfactants in developing economies because of increasing awareness about cleanliness is relied upon to impel market development.